Millions of poor in India are homeless and end up living on the footpath of the cities. They sleep in the open without a bed. The primary school students of Matruchhaya Kanya Vidyalaya, Bhuj, Gujarat, designed a comfortable and cost-effective bed for them based on the concept of “One man’s trash is another man’s treasure.” These beds were made from gunny bags (used for packing wheat and rice) by stitching the bags together and stuffing them with newspaper strips and waste cloth. With the support of the community, the children gathered newspapers from the neighbours and waste cloth from tailors. They cut and stitched the gunny bags to a suitable size, cut the newspapers into strips, moistened and dried them to make them soft like cotton, and then stuffed them into the beds along with waste cloth. Pillows were also made. These were then donated to the needy. This solution aligned with the first goal of the United Nations’ Sustainable Development Plan, i.e., No poverty. Though this was all common sense being put into practice, it was nevertheless a unique approach to education.This method, based on the ‘Reggio Emilia Approach to Education’, allows the children to better understand their skills, potential and responsibilities as citizens. For example, Grade Two students were given a project by the City Zoo. They had to develop an audio tour for the Zoo. Once the stakeholders at The Riverside School were convinced, they wanted to share this idea with the community at large… that children matter, that their opinions carry weight and their needs are important. 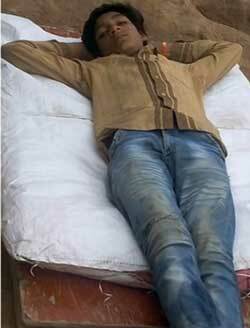 Sethi recalls, “On August 15th, Independence Day 2007, the children set out to infect Ahmedabad. Now it was not about Riverside School. It was about all children. So, we were shameless. We walked into the offices of the municipal corporation, the police, the press, businesses, and said, “When are you going to wake up and recognize the potential that resides in every child? When will you include the child in the city? Basically, open your hearts and minds to the child.” From those conversations sprung the concept of ‘Street Smart’. Every alternate month, the busiest street in Ahmedabad (Law College Road) gives children a chance to be a visible population in the city. It turns into a playground for them — games, street plays, etc., all carried out with a focus on the child. Thus, the NGO AProCh was set up — A Protagonist in Every Child — to make cities child-friendly. AProCh gave India its first child-friendly city — Ahmedabad. The concept has now spread to other cities like Baroda, Surat and Aurangabad. 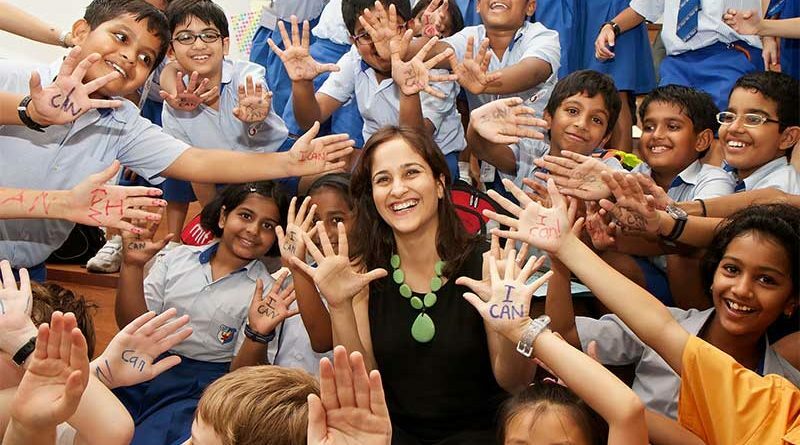 Not content with infecting the city of Ahmedabad, Sethi and her team at The Riverside School decided it was time to infect India with the “I CAN” bug. Thus, in the year 2009, Design For Change (DFC) was set up. They designed a simple toolkit, converted it into eight languages, and sent it out to sixty thousand schools across the country. They gave children a simple challenge — to take one issue that bothered them, to pick one week to develop a solution and implement it. It was a cold call and a risk but one that paid off richly. “In the first year itself, seven hundred stories poured in from across the country. Children were designing solutions to a diverse range of problems right from loneliness to filling potholes in the street to alcoholism. Thirty-two children stopped sixteen child marriages in Rajasthan. In another municipal school in Rajasthan, children from the snake charmers’ community decided that they would like to teach their unlettered parents to read and write and so they did — much to the amazement of their teachers and their parents who earlier doubted their capabilities,” recalls Sethi, amazed and elated at their success. Finding the stench emanating from their school toilet unbearable, students at a government school in Trichy district in Tamil Nadu designed low-cost urinals. They found that their antiquated drainage system did not allow the students to use the urinals comfortably without urine spraying everywhere. Students decided that urinals needed to be built; however, the cost was prohibitively high. A student realised that the twenty-litre Bisleri plastic cans used for drinking water could be creatively recycled. The students collected funds and purchased old Bisleri cans, pipes and other material to set up a completely new urinal system. They cut the jars, painted and installed them in the toilets at a height appropriate for the young students. There is no stench anymore. This idea has been shared and implemented by other schools in the area too. This solution aligns with the sixth goal of the United Nations’ Sustainable Development Plan, i.e., clean water and sanitation. 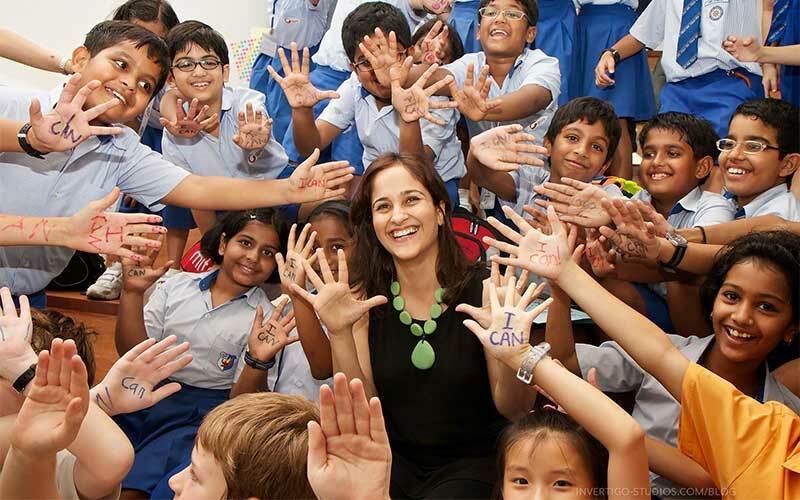 A few months in, Sethi was invited to a TED talk to speak on her experience of empowering children. The talk went viral overnight. There were requests from across the globe requesting permission to use the idea. Of course, they could. It was an open-source idea. Anyone could borrow it. Anyone could implement it because it was brilliant in its simplicity. The design-thinking framework had just four main steps — Feel, Imagine, Do, Share. Taiwan was one of the first countries to come on board. Kate Hsu, an English teacher at the High School of Taiwan Normal University, came across this TED Talk at a time when she was concerned about her students’ learning process. They were more concerned about the grades on their test papers rather than enjoying the process of learning. The idea felt natural to her because of her students and their frustrations combined with her hopes and dreams for them. She was so enthused with the idea that she contacted Design For Change and travelled to Ahmedabad for a month’s training. Design For Change is now in sixty-five countries with over twenty-five thousand documented stories of change. Each country functions independently — they source their own funding, conduct their own challenges, and have their own jury and awards function. But they are all part of the Design For Change family. Two years ago, Monica Canton de Celis of Design For Change Spain connected with Br Juan Antonio Ojeda, responsible for educational affairs at the Catholic International Education Office (OIEC), who felt that this idea needed more visibility. They also realized that the changes wrought by the “I Can” Challenge tied in neatly with those presented in the Pope Francis’ encyclical Laudato Si (Care for Creation) as well as the United Nations’ Sustainable Development Goals for 2030. So, on 9 June 2017, Sethi met Pope Francis to sign an agreement to introduce the “I Can” challenge to 460,000 Catholic schools worldwide. 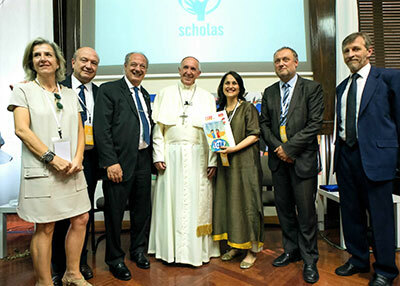 This will be done through a collaboration with OIEC (International Office of Catholic Education) and Scholas Occurrentes, a programme that was started in 2001 in Buenos Aires by Jorge Bergoglio (now Pope Francis) when he was a bishop. Anjali Heredia Gracias is a freelance writer and is currently on the Editorial team of EduFocus — the magazine of the Archdiocesan Board of Education, Mumbai. She holds a Bachelor’s degree in Commerce from the University of Mumbai and a post-graduate diploma in Management (Marketing and HR) from Goa Institute of Management.